Save space and promote comfort at the same time! Office Furniture Deals provides dupable stack chairs and stackable office seating solutions from the best brands in the business. Here shoppers will enjoy stackable office chairs in a variety of designer fabric and leather upholstery options, as well as easy to clean plastic stack chairs for healthcare, educational, and training environments. 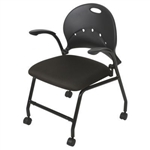 All of the stackable office seating online at OfficeFurnitureDeals.com includes free shipping. Many of our stack chairs are available in affordable two, four, and six pack sets to provide our valued shoppers with additional savings. 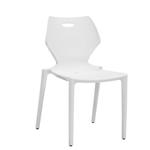 Need help finding the perfect stack chair for your space? Contact our staff of seating specialists today at 800-456-6746! Your Price: $69.00 + Free Shipping! Your Price: $262.00 *Call for Additional Savings! Your Price: $272.00 *Call for Additional Savings! Your Price: $352.00 *Call for Additional Savings! Your Price: $228.00 *Call for Additional Savings! Your Price: $420.00 *Call for Additional Savings! Your Price: $226.99 + Free Shipping! Your Price: $205.99 + Free Shipping! Your Price: $253.99 + Free Shipping! Your Price: $75.00 + Free Shipping!